Disney announced release dates for a slew of movies, and one of the notable dates is that the final episode of the Star Wars saga will move back to it’s old traditional release month, specifically May 24th, 2019 – which is the day before the 42nd anniversary of the first movie. The Han Solo anthology movie also releases in May in 2018. In addition, Disney has pushed back the fifth Indiana Jones installment a year to July 10, 2020, giving the old slot of July 19th, 2019 to the upcoming live action version of The Lion King. Yes, it is finally happening! Disney, which purchased the film rights to the Indiana Jones franchise from Paramount in 2013, just announced that there will be a new Indiana Jones film with the old gang – Harrison Ford will star, Steven Spielberg will direct, Frank Marshall and Kathleen Kennedy will produce. The film is planned to be released on July 19th, 2019. Marshall and Kennedy have been involved at the start – the two, married in 1987, were both involved starting with Raiders of the Lost Ark – Marshall as producer, and Kennedy as the assistant to Spielberg, and both cofounded Amblin Entertainment with Spielberg. Kennedy is now the president of Lucasfilm after the acquisition by Disney. No mention of Shia LaBeouf, who was the heir apparent to the franchise when Indiana Jones and the Kingdom of the Crystal Skull was released in 2008 – until that film nearly sunk the franchise. Whether they will try again to pass the fedora on is unsure, but it is expected to involve younger actors. Melissa McCarthy to be a Ghostbuster; Chris Pratt to be Indiana Jones? The first lead actress to take on the gender-flipping Ghostbusters remake is Melissa McCarthy, who worked with director Kevin Feig in Bridesmaids and The Heat. Bridesmaids cast mate Kristin Wiig is reportedly also in negotiations as one of the team, as is current Saturday Night Live cast members Leslie Jones and Kate McKinnon. Now hey may have found are more apt successor, perhaps to replace Harrison Ford as Indy himself, in Guardians of the Galaxy star Chris Pratt, according to Deadline. It’s all very early, but it appears the studio is looking at Pratt to lead the franchise, but it will have to wait as Starlord needs to finish The Magnificent Seven for MGM/Sony and of course the obligatory Guardians of the Galaxy 2. Following up on the news of the release of the Indiana Jones: The Complete Adventures Blu-ray set on September 18th, we have some details on the bonus features and specifications that will be included! And don’t forget to pre-order today and help us out! 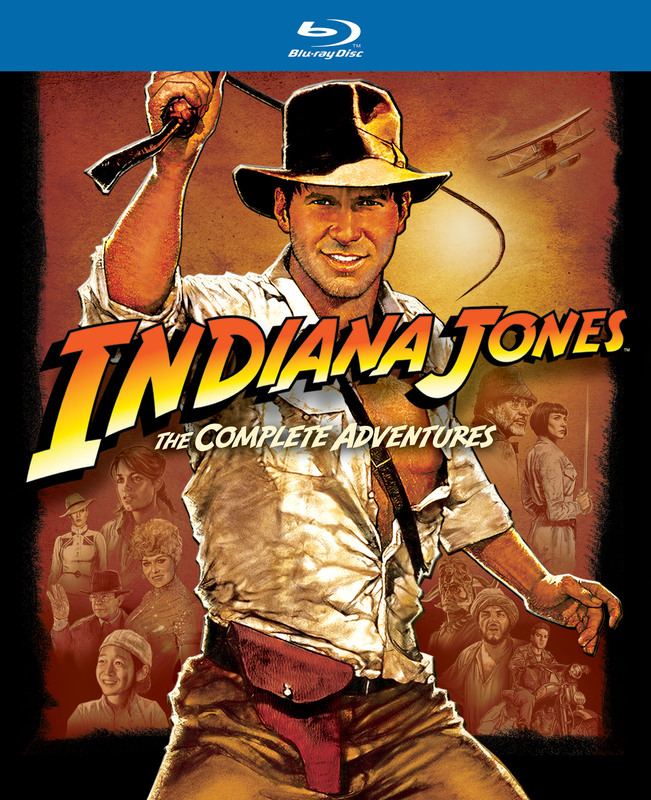 Indiana Jones: The Complete Adventures on Blu-ray September 18th! All 4 Indiana Jones adventures: Raiders of the Lost Ark, The Temple of Doom, The Last Crusade and The Kingdom of the Crystal Skull, will be released all on Blu-ray in the Indiana Jones: The Complete Adventures set on September 18th, 2012 – marking the first time that the first three movies will be released on Blu-ray, and includes a specially remastered version of Raiders of the Lost Ark! Illustrator Ralph McQuarrie, best known for the artist who rendered images of Darth Vader (including giving him his iconic helmet) and other scenes in pre-production for the original Star Wars films, passed away Saturday at the age of 82. He also provided the artwork for other major films like Raiders of the Lost Ark, E.T. : The Extra-Terrestrial, Star Trek IV: The Voyage Home, and Cocoon. The official Star Wars Facebook page put up a gallery of some of his images. I haven’t heard from too many people that think Indiana Jones and the Kingdom of the Crystal Skull was great cinema – the plot was far more fantastical than the previous efforts and the action situations even more so – but George Lucas and Steven Spielberg may be betting that the audience is willing to forgive as they are working on a new script for Indy 5, and Harrison Ford is on “stand-by” for filming next year. Reportedly they will try and get back to Indy’s cinematic roots and avoid the CGI frenzy of the last movie. And this will definitely be the last movie of the franchise (at least with Ford, as who knows…) Are you willing to forgive? I think after two really great movies sandwiching mediocre movie, I can forgive a stinker…maybe it’s the inverse of the Star Trek movie curse…Updated 6/11: According to a tweet from producer Frank Marshall, they are NOT ready and the rumor is false.